Everybody’s heard about Blackwing monsters, because they’re one of the hottest Decks to come out in years! Blackwings first showed up on the Yu-Gi-Oh! 5D’s TV show. They’re Crow’s favorite monsters. And ever since then, Duelists like you have been using Blackwings to win lots of Duels, including Championship tournament events! Blackwings are popular because they’re fast, powerful, and just keep on coming. Now Duelist Pack: Crow might be the best way ever to build your own Blackwing collection, and make a top-notch Deck to rule the sky! 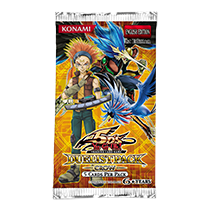 Each Duelist Pack: Crow pack contains 5 of Crow's favorite cards, plus 1 tip card explaining a secret strategy for your Blackwing Deck! It’s another chance to get some of the most powerful and popular Blackwing cards, including their big Synchro Monsters like Blackwing Armor Master, Blackwing Armed Wing, and Blackwing - Silverwind the Ascendant. Duelist Pack: Crow is loaded with brand new cards too, like the latest Blackwing Trap Card: Black Return. This powerful card lets you bounce an opponent’s monster off the field, and gain Life Points equal to that monster’s ATK. All you have to do to use this card is Special Summon a Blackwing monster. And that’s easy, because swarming the field with Special Summons is one of the things Blackwings do best! Another great Special Summon card is the new Blackwing - Zephyros the Elite. You can use this monster along with your powerful Blackwing Tuners to do a Synchro Summon, then bring Zephyros back from the Graveyard for another Synchro Summon! Speaking of Blackwing Tuners, Blackwings have a lot of them, and some of the best are available again in this pack. But they’ve never had a Level 4 Tuner – until now! Blackwing - Kochi the Daybreak is the Level 4 Blackwing Tuner you’ve been waiting for. He lets you pull off high-Level Synchro Summons like Black-Winged Dragon with just 2 cards! Whether you’re just starting out with Blackwings, or looking to preen your existing Deck a little more, Duelist Pack: Crow has the cards you need! Crow is probably my absolute favorite 5D’s character, if not fav YGO! character, so I had to buy this when it was out!